Karl Jo Seilern is the CEO of Pinspire (right), a 99% ripoff of mysteriously super-popular Pinterest (left). They look the same, sound the same, are the same Only one of them is a German clone! So we talked to Karl. [3/2/12 9:53:59 AM] sambiddle: Hi Karl, are you there? [3/2/12 10:43:00 AM] sambiddle: were you inspired by Pinterest? [3/2/12 10:45:29 AM] sambiddle: Are you still there? [3/2/12 10:49:42 AM] Karl Jo Seilern: No, we don't. It has all been developed by our team. Surprisingly good copy job, guys. 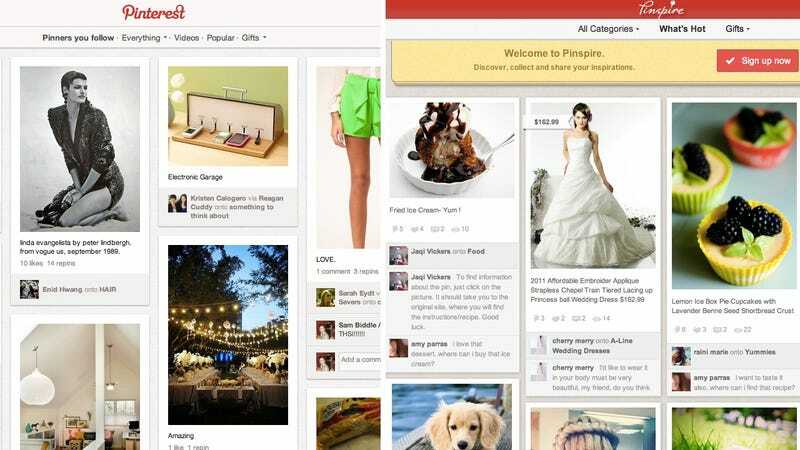 [3/2/12 10:50:25 AM] sambiddle: what would you say to critics who might call pinspire a "ripoff" or "theft" of Pinterest? [3/2/12 10:51:40 AM] sambiddle: Sure. [3/2/12 10:52:18 AM] sambiddle: With a few small exceptions, the sites are identical. [3/2/12 10:58:54 AM] sambiddle: Even the logos are both in cursive. [3/2/12 11:02:29 AM] sambiddle: hey, still there? [3/2/12 11:04:37 AM] Karl Jo Seilern: First, we believe that no one has the right to monopoly (competition creates a situation where consumers win: it forces companies to out innovate each other to create a great product). Google didn't invent the first search engine, right?.... But we also acknowledge that a one to one copy is not valuable in the long term. We can only create a tight and strong international community by creating in the long term new, innovative features, that improve our user experience in all international markets that we have a presence in. Expect that we move beyond offering local content in local language... we do look very similar right now as the current focus is to spread the idea internationally to local communities, but once reach this milestone, we will heavily focus on creating innovative ideas to consistently improve the user experience. This doesn't make any sense at all. The best way to stoke innovation is to copy other people? [3/2/12 11:06:28 AM] sambiddle: Would you consider Pinspire a one to one copy of Pinterest? [3/2/12 11:11:58 AM] Karl Jo Seilern: No. Our design is very similar, but we offer a different value proposition to users...A lot of users find value in the fact that they can interact in their own language, and with content that is local and may be more relevant (ex. weddings in Germany/Spain/Brazil are different than weddings in the US). We believe this enriches a user's experience. [3/2/12 11:12:32 AM] sambiddle: But the websites look exactly the same, right? [3/2/12 11:16:50 AM] sambiddle: Karl? [3/2/12 11:18:23 AM] Karl Jo Seilern: Sorry! it is the end of the day, and the team is giving me updates. [3/2/12 11:18:46 AM] sambiddle: No problem. [3/2/12 11:23:13 AM] sambiddle: You don't think the two sites look extremely similar? [3/2/12 11:29:52 AM] Karl Jo Seilern: The differentiating factor, again, is the content and also funtionalities. Our users appreciate that content is local, and they can use their local language. This is very different to what you will find on Pinterest. For the moment, we think this matters more than color and logo font. The same blah blah. And he won't tell me if those people work at Pinspire! [3/2/12 11:33:24 AM] Karl Jo Seilern: We just took our company photos yesterday. This placeholder will be taken down once we publish it. [3/2/12 11:34:04 AM] sambiddle: Sure! [3/2/12 11:36:21 AM] sambiddle: Have you made a pretty good living cloning American sites? [3/2/12 11:38:39 AM] sambiddle: Do you plan on coming up with your own ideas, or do you think you'll stick to copying American sites? [3/2/12 11:40:15 AM] Karl Jo Seilern: Again, this is something you need to ask the investors. I can't speak for them. [3/2/12 11:40:31 AM] Karl Jo Seilern: sent file "pinspire_gang.jpg"
[3/2/12 11:40:31 AM] sambiddle: Do you have a personal opinion as CEO? [3/2/12 11:42:23 AM] Karl Jo Seilern: Well I can answer questions about pinspire, but again, I just can't talk for the investors (sorry). [3/2/12 11:42:40 AM] sambiddle: How do you think the people at Pinterest feel about you copying the site? [3/2/12 11:42:47 AM] sambiddle: Do you feel guilty at all? [3/2/12 11:48:02 AM] Karl Jo Seilern: As I said, we bring a lot of value to our users in the fact that we are local. We are happy with the positive feedback we get from our users. [3/2/12 11:48:14 AM] sambiddle: Yeah, but how do you think Pinterest feels? [3/2/12 11:52:20 AM] sambiddle: Do you think completely ripping off a website in pretty much every possible way is competition? [3/2/12 11:55:37 AM] sambiddle: How is a German wedding from an American wedding? I've never been to one. [3/2/12 11:58:54 AM] Karl Jo Seilern: For one, it is almost never outside. two, we don't have the same idea of bridesmaids and grooms (sadly). Three our wedding cakes are considerably smaller. Four, we most likely consume much more beer. [3/2/12 11:59:09 AM] sambiddle: Ah okay. Well I think that explains everything for me, have a good night Karl. So, there you have it. Pinspire isn't a ripoff of Pinterest because German weddings involve smaller cakes and are almost never outside. Thanks Karl—just don't get any ideas about Goozmodo!